Let Leap Year Inspire You! You have an extra day this month thanks to Leap Year! Perhaps you can start a new tradition on Leap Day by submitting work to one of the short story contests closing on the 29th. 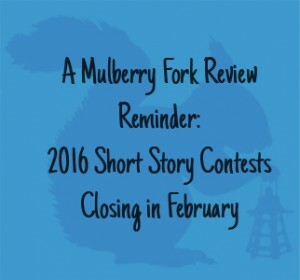 It’s Amy Burns, Managing Editor of Mulberry Fork Review, here with a reminder of a few 2016 short story contests closing in February. Although I cannot guarantee glory and prizes, I know that writing goals can be beneficial. Deadlines and the lure of potential prizes, are they enough to get the words flowing for you? If you like the idea of a ‘rolling’ literary competition, the Bath Flash Fiction Award might be right for you. The award runs every four months with a total prize giveaway of £4,200 per year. They promise a quick response time with the last winner announced within a week of the closing date. While I can’t say with a cross-my-heart-and-hope-to-die certainty that they will be that quick again, the fact that they make an effort to reply soon is a plus. The word limit is 300 max, and the entry fee is £7.50 for one entry. If you submit 3 flashes the entry fee is £18. You can find the rules here. The shortlist will be read by Tania Hershman, who is wonderful. Get thyself to her website quick sticks. You may notice that the contest deadline was extended to February 15th which is a bonus. They are looking for submissions of 1,000 words or less. The first place winner receives $1,000/publication; 2nd place receives $250/publication, and all submissions are considered for publication. The entry fee is creeping up a tad high at $17, BUT there is one detail which might ease concerns. The general guidelines state that you are allowed to submit up to THREE stories with your entry. You can dig into the details here. A woman creeps through the ductwork of a quiet home. A medical procedure reveals an object of worship. A carnivorous reptile divides and cauterizes a town. Amelia Gray’s curio cabinet expands in Gutshot, where isolation and coupling are pushed to their dark and outrageous edges. A master of the macabre, Gray’s work is not for the faint of heart or gut: lick at your own risk. The next of our 2016 short story contests closing in February is the Fish Flash Fiction Prize. Nuala O’Connor is the Dublin-born novelist, short story writer, and poet judging this year’s competition. You can catch a trailer for her latest novel, Miss Emily, here. This contest dates back to 2004 and offers a first prize of €1,000. The second place winner receives an online writing course with Fish Publishing. Ten winners will be selected for publication in the 2016 anthology. Online entry is €14 for the first and €8 for additional entries. Fish offers an optional critique for €30. For more details about how to enter and cost for postal entries see here. There is a 300-word max. It may be of some importance to note that Fish gives particular attention to emerging writers in that they restrict the entry of previous prize winners. Details are available on the website. I like Glimmer Train. It was one of the first literary journals I ever read and while I think their acceptance rate is something like 1/10th of 1%, we can dream can’t we? (Just nod sweetly.) But, here it is. The Glimmer Train Short Story Award for New Writers which is a different animal than standard submissions. The reading fee is $18, and the max word count is 12,000; although, they are kind enough to point you in the direction of an average of 1,500 – 5,000. As if publication in Glimmer Train wasn’t enough, first prize wins $2,500, publication and ten free copies; second prize wins $500, and third prize wins $300. If you win second or third, and they decide that you’re a real fancy-pants, then they’ll publish your story, pay you $700 and give you ten free copies instead of the prize listed above. Ah, just check out the details here on their rules page. That’s what you should be saying to yourself right now. Without further ado, I’m going to write. You’ve got a tidy recap of a few 2016 short story contests closing in February, now fueled by the desire to put some art into the world and to make yourself a few ‘squid’ (or ‘bucks,’ if you’re in the United States) on you go. I wish you the very best of luck if you do decide to enter the contests. Hey, I’d love it if you drop me a line or leave a comment and let me know if you do, or what your experience has been thus far with lit competitions.